Back in September, when I went to the County Archives, I parked on West 29th Street. I saw this lovely Greek Revival house, and stopped to photograph it. 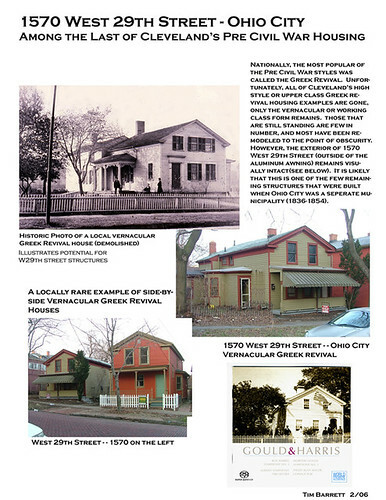 Later, I used GoogleMaps Street View to verify the address before adding it to my attempt to map all the extant Greek Revival houses in Cleveland. The image presented by Streetview was depressing. See why it's so depressing? Take a look again at the first photograph. Note the vast empty space. 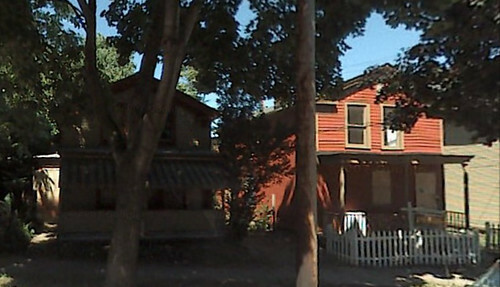 The house to the left was another Greek Revival structure, built in the 1840s or 1850s. With so few houses that old left in the city, it seemed completely wrong that one would be demolished. The other night, I was browsing the Cleveland Landmarks Commission agendas. I hadn't really taken a look at them before, but I've come to realize that I need to be aware of their proceedings. I saw a familiar house in the photos for the April 24, 2008. 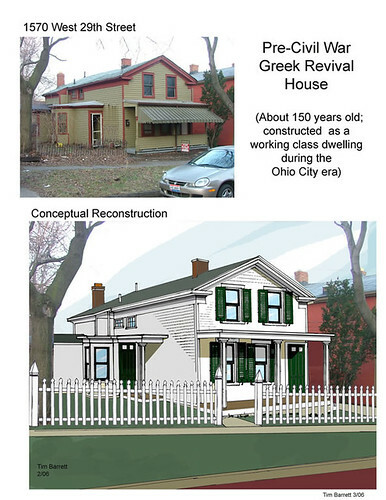 Photograph courtesy of the Cleveland Planning Commission. 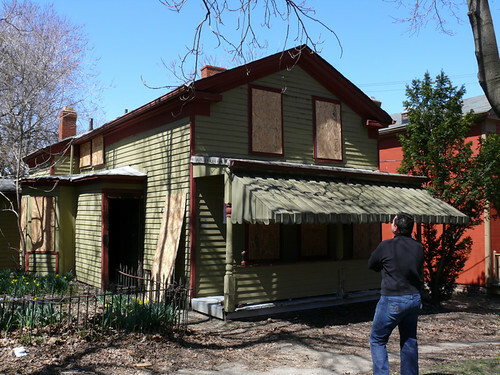 A demolition permit was being sought. This surprised me. 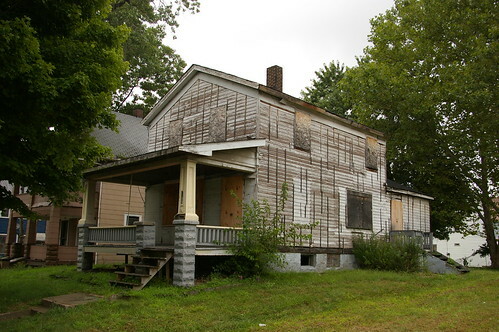 It was hard to believe that someone who might demolish a house like this would actually ask. The house didn't look that bad at first glance. The windows were boarded up, yes, but so are the windows on so many other interesting and worthwhile houses in Cleveland. Then I saw the interior. It had clearly suffered serious fire damage. Damage such that it failed my most optimistic test: would I take it if I were a single man and someone offered to give it to me? If under those conditions, I wouldn't be interested in the house, it's hard to fault others for not being interested under less favorable ones. Now, if this house was on my block, that would be another matter. Then I'd try to con some other like minded idiots into working on it with me. Why is this house so important? The 2006 date on Mr. Barrett's plea for the house made me curious, so I looked back to the Landmarks Commission agendas for that year. The agenda for March 9, 2006 features a familiar house. Permission to demolish it was being sought then, too. This makes me wonder about the cause of the fire, but I have not been able to learn anything more about this one way or the other. 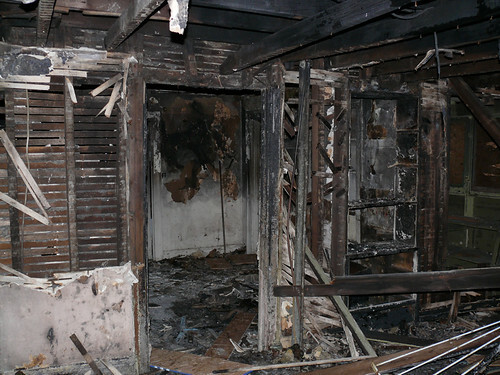 I encourage you to look at the photographs from the Planning Commission's March 9, 2006 meeting, to see the house before the fire. Also look at the photographs from the April 24, 2008 meeting. Note that several of the interior doors appear to be original. Restoring a house like this isn't as complicated as, say, a Victorian, or even a 1920s bungalow. The level of trim is minimal, so stripping and refinishing it would not be so time consuming. Now take another look at this Greek Revival house on East 71st St., just north of Superior. It has good lines, and a bit more space. Adjacent city-owned lots would give you a half acre, if you so desired. 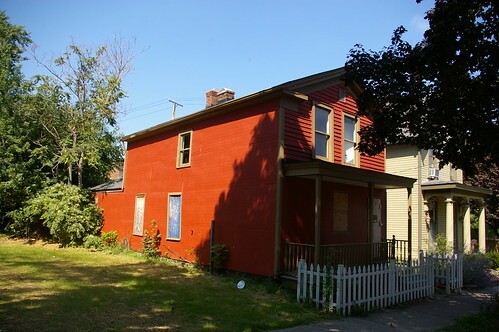 Further, the price would be much more reasonable than the Ohio City address. If it is to be saved, we need to take action now.